These are informational topics and useful tips compiled by our expert growers. Click on any subject below for educational details on practical usage and growing with the Omega Garden™. Omega Garden Int. offers tips and advice on how to get the most from your garden. We provide you information as well as encourage you to send us your “expert advice” on indoor gardening. You may send your information, comments, questions and suggestions to: info@omegagarden.com or omegagarden@gmail.com. 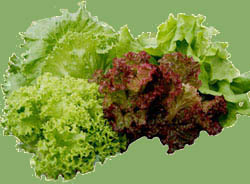 Hydroponics is often defined as “the cultivation of plants in water.”. Research has since determined that many different aggregates or media will support plant growth; therefore, the definition of hydroponics has been broadened to read “the cultivation of plants without soil”. Growers all over the world are using hydroponic techniques due to the lack of a large water supply or fertile farmland. Home gardeners have used hydroponics on a smaller scale to grow fresh vegetables year round and to grow plants in smaller spaces, such as an apartment or balcony. Greenhouses and nurseries grow their plants in a soilless, peat- or bark-based growing mix. The nutrients then are applied to the growing mix through the water supply, therefore, this is also a type of hydroponics. Soilless gardening offers many advantages to the home gardener. Since a sterile medium is used, there are no weeds to remove, and soil-borne pests and diseases are minimized, if not eliminated completely. Properly grown hydroponic plants also are healthier and more vigorous because all of the necessary growth elements are readily available. 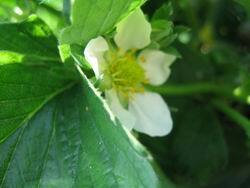 The plants can mature faster, yielding an earlier harvest of vegetable and flower crops. Hydroponic gardens use less space since the roots do not have to spread out in search of food and water. This small space requirement makes hydroponics ideal for home gardeners, and it makes better use of greenhouse space. The big advantage to hydroponics is the ability to automate the entire system with a timer. Automation reduces the actual time it takes to maintain plant growth requirements. Automation also provides flexibility to the gardener as one can be gone for long periods of time without having to worry about watering the plants. Hydroponics offers many advantages for commercial agriculture. Cultivating plants without soil eliminates the need for vast farmland and allows crops to be produced in greenhouses or even in the desert sands. Hydroponic techniques also allow for precise water and nutrient application directly to the roots of each plant. Water is reused in these systems and less is lost through evaporation and run-off. Therefore, arid lands, such as deserts, can be transformed into productive lands using limited amounts of water. Growing plants hydroponically is not difficult if one understands the basic principles. As long as plant growth requirements are met, there are numerous hydroponic systems that can be used. Pre-soaking – Put some moist tissues on a plate. Put the seeds on top of them and then put a layer of moist tissues on the seeds. Cover the plate with another upturned plate, so that the seeds are in darkness and the environment remains moist. Put the covered seeds in a warm place (21°C). Check the seeds every day, sprinkle the tissues if necessary and carefully transplant the seeds when they open and the tip of the root becomes visible. Put the seed in a growth medium (soil or rock-wool), approximately the size of the seed under the surface (about 5 mm). Sowing in the growing medium – Place the seeds under the surface in the growing medium at approximately the size of the seed. Regularly sprinkle the growth medium with water, but make sure that the soil or the rock-wool does not become too wet. 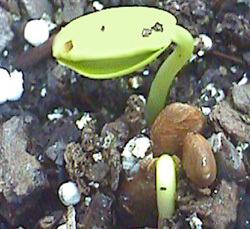 The seedling uses the spare food present in the seed for growing. Air is very important for its metabolism. So make sure that the soil remains sufficiently airy. One of the characteristics of rockwool is that it retains much air. Make sure that the rockwool is not standing in water and that the excess water is able to drain away properly. Rockwool has a fine germination climate for the seeds. Remove the cover as soon as the seedlings reach above the medium. Outside growing – Although it is possible to have the seeds germinate immediately outdoors, the germination percentage will be considerably higher if you first germinate indoors. From April to May the ground temperature is not yet ideal. Regularly put the emerged seedlings in a place where they can get used to outdoor conditions. Young seedlings – The young plants are still very delicate. Therefore you should not place them in direct sunlight or just below a 400 Watt lamp. This might cause burning. Provide young plants with nutrient water and add Boost to strengthen the root system. Whether a plant is grown in soil or a soilless medium, there are many factors affecting plant growth and productivity. All plants require nutrients, water, light, and air to grow. A plant grown in soil obtains nutrients and water from the soil, when available. With hydroponics, because water and nutrients are always available, the plant is never stressed. Sunlight and air are readily available in an outdoor hydroponic system. However, for an indoor system, one must provide an adequate light source and good air circulation. Metal halide lamps, sodium vapor lamps, gro-lights, or fluorescent lights used in conjunction with incandescent light bulbs provide adequate light. Plant roots must have oxygen available to keep them alive. Healthy roots (which are white in color) are responsible for the uptake of all nutrients for the plant. If the roots die, it is impossible for the plant to survive, even if the plant growth requirements are met. Air circulation around leaves is important since it mixes the air and allows the plant to draw out the carbon dioxide necessary to carry on photosynthesis. Air circulation also helps prevent fungal diseases caused by moist, stagnant conditions. Indoor units often have a small fan to circulate the surrounding air. Powdery mildew (mycelium) is a common fungal disease that affects many types of plants. 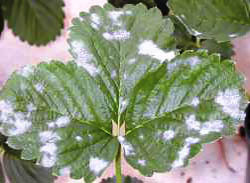 The fungus will coat leaves, stems and flowers and looks like a white fuzz or powder, usually starting on lower leaves. This can lead to serious crop damage if left unchecked and can infect crops at any stage of the plants life. Preventative steps can and should be taken to prevent the onset of powdery mildew which thrives in cool, damp, shaded and /or poorly ventilated grow rooms. Practicing preventative steps and keeping the air in the grow room clean (hepa filter) can help reduce or eliminate the onset of powdery mildew. Dilute 1 part Organic whole milk*, with 10 parts water. Spray liberally on affected plants. Thoroughly wash off the milk solution with water one or two days after application to prevent the milk spoiling and leaving a sour smell. Do not spray on plants when in flowering stage. This treatment works so well usually one treatment is sufficient. *Note – Only use Organic (non-pasturized) whole milk. Mix 1/4 teaspoon of Baking Soda with 3/4 teaspoon of Epsom salt in 1 litre ( 4 cups) water. Mix solution well. Foliar spray the plants liberally. Wash off after one or two days by misting with water. 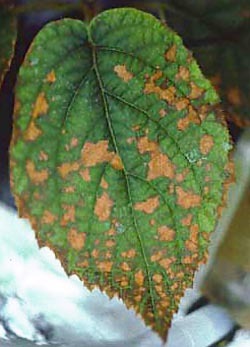 Note: The solution will leave a white haze on the leaves of the plants which does looks similar to the mildew. We have coined the phrase “Orbitropism” based on Geotropism. Geotropism is caused by plant growth hormones known as auxins. Auxins can speed up or slow down the growth of certain areas of a plant. If a plant stem falls and continues growing it is thought that the stem bends upward when auxins are pulled to the bottom side of the stem by gravity. The bottom side then grows faster than the top side which causes it to bend upward, As the stem becomes upright again the auxins even out and the stem then grows straight. The Omega Garden™ is the best way to maximize grow space, minimize power consumption, and utilize geotropism to spread growth auxins throughout the plant plants grown in these systems are quite bushy and well filled in.